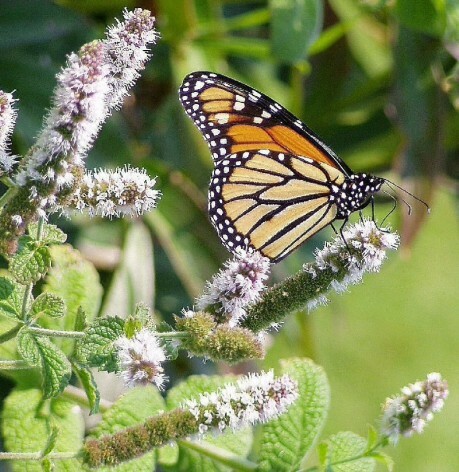 A monarch butterfly rests on some mint leaves enjoying the warm weather. OSWEGO, NY â€“ Summer begins at 7:28 a.m. today, taking over from a spring that was the warmest on record. The average temperature for spring 2010 was 50.8 degrees. That is 5.9 degrees warmer than usual, according to Bill Gregway, local observer for the National Weather Service. For his records, Gregway breaks the seasons into four three-month blocks with spring being March, April and May. The highest temperature this spring was 85 degrees on May 31 and the lowest was 18 degrees on March 27. There were three new high temperature records set; 80 degrees on April 2, 84 degrees on April 3 and 81 degrees on April 8. A reading of 83 degrees on May 2 tied the high for that day, Gregway added. The last frost was on May 11 when the mercury sank to 35 degrees. April and May had no temperatures at or below freezing, Gregway said. The last 32 degrees or below was the 18 degrees on March 27, he noted. March was the seventh warmest, April the second warmest and May tied for fourth warmth, according to Gregwayâ€™s records. Total precipitation for the season was 1.02 inches. That is 3.83 inches below average. Each month this spring received just a trace of snow. That left spring 23.6 inches below the average snowfall. For the winter of 2009-2010, snowfall fell 33.8 inches short of normal. Spring saw 56 percent of the possible amount of sunshine. Thatâ€™s 5 percentages above average. The number of cloudy days for spring, 36, was 8 below average. The number of partly cloudy days, 35, was 9 above average. The number of clear days, 21, was 1 below average. â€œSpring was warm, dry and sunny. Just about everything was 2 weeks early,â€ he continued. There were 4 thunderstorms, which is 1 below average. There were 5 foggy days, which is 1 above average. According to Gregway, precipitation fell on 37 days and no precipitation fell on 55 days this spring. The highest barometric pressure was 30.61 on April14 and the lowest was 29.31 on April 26.
â€œStrawberries are about 2 or 3 weeks ahead of schedule. And, the tree crops all seem to be early, too,â€ Gregway said. June seems to be a different story. The average temperature for the spring of 2009 was just 1.3 degrees above average. There was 1 new high temperature record, and 1 was tied. Total precipitation last spring was 1.32 inches above average and the snowfall was 1.9 inches for those 3 months. The rest of the figures were â€œabout the sameâ€ as this spring, Gregway observed, adding that the spring of 2009 had 46 days of precipitation and 46 dry days. â€œThings were about a week early last year. This year, itâ€™s been 2 or 3 weeks ahead,â€ Gregway said.